Revolution Rhythm LLC is pleased to announce, effective immediately, that it has been granted preferred vendor status with Denton, TX Independent School District (ISD). The Sounds Around The World Geography Program is now available to all 73 school districts that are members of the Educational Purchasing Cooperative of North Texas (EPCNT). Revolution Rhythm LLC is pleased to announce that it has been granted preferred vendor status with Denton, TX Independent School District (ISD). The Sounds Around The World Geography Program is now available to all 73 school districts that are members of the Educational Purchasing Cooperative of North Texas (EPCNT). The patented Sounds Around The World program offers an arts-integrated geography game that combines diverse global music with team competition, inspiring classroom learning through play. Through the integration and immediacy of music, Sounds Around the World takes 5th through 12th grade students on a “sonic field trip” to teach geography, cultures, civics and other essential 21st century skills. Sounds Around the World aligns with TEKS, NCSS-C3 Curriculum and Common Core standards. "The sound instructional approach of Sounds Around The World uniquely engages students by enhancing their mental maps of the world and by deepening their understanding of world cultures through music. In our interdependent world, we need teachers who can make geography come alive, and Sounds Around helps teachers do just that." The newly acquired preferred vendor status provides the opportunity for Revolution Rhythm LLC to greatly expand the presence of Sounds Around the World in Texas and to add to the growing number of schools and school districts across the United States that have implemented the program. Baltimore City and Howard County, MD, school districts, as well as schools in 13 other states are already part of the program’s expanding market. 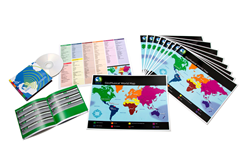 Each Sounds Around the World Teachers’ kit includes: CD with 37 world music tracks; 10 color-coded geo-musical maps; 111 geography hints; a music origins answer key; 16 page teacher’s guide; and Geo-musical world coloring maps. Purchases can be made by members of the EPCNT through their ISD procurement departments from Revolution Rhythm LLC. Revolution Rhythm, LLC utilizes the art and science of music to engage and inspire people and organizations. The company designs and implements arts-integrated curriculum, music therapy services, and team-building programs. For more information, or to schedule an interview with Jason Armstrong Baker, please call Jason at (443) 961-7974 or email Jason at jabaker(at)getsoundsaround(dot)com. Sounds Around The World patented geography program now available to 73 Texas school districts through achievement of preferred vendor status.